What is Financials for Office 365? Whether you are a first time user or have outgrown your existing business applications, Financials for Office 365 is filling a gap in the market and provides small businesses big business software at an affordable price, from as little as a dollar per day. It is Microsoft cloud accounting software that is simple-to-use and particularly strong in areas such as inventory management and business reporting that are lacking in many products on the market. Financials works stand-alone but when used with Office 365 it becomes a complete and integrated Microsoft cloud solution. Jethro Consultants is an accredited Financials for Office 365 Partner. We would be happy to help you consider a move to cloud accounting and Financials for Office 365 has attractive pricing and great features. Watch this short video to get a quick overview. Financials is cost effective with no minimum agreements. Simplypay-as-you-go for what you need. For more information go to www.o365financials.com. Going Paperless - is it a dream? The Paperless office was envisioned years ago but it hasn’t really eventuated in most businesses I visit. But there are many little things you can do to avoid using more paper than you need to. Some of these include using cloud storage for files, moving your accounting system into the cloud, and sending and receiving statements and invoices electronically. We have recently shifted to cloud accounting (don’t know why it took me so long) and have experienced a real productivity gain in data entry with bank accounts syncing transactions straight to our accounts. In addition, we are starting to shift our paper invoices and bills into electronic formats and save them online. One thing you can’t get rid of all together is the paper receipt needed for business from a EFTPOS terminal. However, you don’t need to keep them. Scanning them and then saving them online is the best way to do this. And you don’t need an expensive scanner. Most good ones designed for document storage start around $500 or more. Simply use the Office Lens App on your Android iOS or Windows phone and you can scan straight into OneNote – and thence into your cloud accounting system. Talk to us about the significant advantages to your business by reducing Paper and By using Cloud Accounting. Are you using OneDrive for Business or SharePoint? If so you may have had a bit of a bumpy ride recently with updates to the sync tool. The new sync tool is here and is far better, removes the old limitations and works – well let’s just say – as it’s supposed to! Read on for more info if you have had issues. Office 365’s cloud storage in SharePoint and One Drive for Business is wonderful – gives you access to your data anywhere, version control and collaborative editing and sharing amongst many other features. However, the sync tool used to sync libraries to your PC has been buggy and had some limitations. To be fair these were mostly legacy issues that didn’t matter back when the size of libraries online was so much smaller. Now we expect to store large quantities and Office 365 certainly gives your business a heap of space. The OneDrive for Business Next Generation Sync Client is now available for Windows 7, 8 and 10 machines (coming to Windows 8.1 in the first quarter 2016 sometime) and for MAC )S X 1.9 and above now. However, it is not rolled out in regular windows or office patches but needs to be deployed. At the moment it does NOT support Windows 8.1, or SharePoint libraries - though these capabilities will be added soon. It can run alongside the current tool and works just fine. I have been running the pre-release version since November with ZERO problems – not something I could say about the previous tool. This Office Support Article has all the details as well as guides for Windows and MAC for deployment. Did you get to the end of the Financial Year in good shape? I certainly hope 2014-2015 was a good year for you and that you are looking forward to lots of new prospects, sales and good business in the next. I have outlined below some end of year things that you should take note of. There are lots of things to do at Financial Year End. Preparing Trust and Company minutes, getting stocktakes done and preparing final things for your accountant are some of the important ones. However in this newsletter I want to highlight some often neglected ones. Allow you to recover from the last day, week, month, year – meaning you have access to media with those data sets on them. Be recorded – note who did the backup, when and what was backed up as well as the media it was stored on if your system does not do that for you automatically. Be tested – at least once every 3-6 months you should run a recovery test to ensure that you can recover your data in the case of a failure. Contact us now if you can’t tick off all those items for your backups. Nearly every business uses Excel Spreadsheets. And none more so than office staff, accountants and book keepers. While Excel is a fantastic Business Intelligence tool a quick google search on parliamentary inquiries excel errors will scare the pants off you. I have seen first-hand how QLD government has reported incorrect numbers based on spreadsheets with errors in them. Most businesses also have the same problem – even mine! Relying on spreadsheet data for financial information needs to be done with the right auditing tools in place to ensure fidelity of the data, and comparison with the source (accounting) data. Done right Excel Reporting tools can greatly improve a business’s ability to manage their financial information, management reporting and other data. I have 27 years of experience of working with financial data in Excel (since version 1 and Lotus Notes before that). If you would like some assistance to ensure that your spreadsheet design (or your accounting staff’s spreadsheets) are accurate there are some simple things we can do to assist you. Even if that is just a couple of hours of specific training in good spreadsheet design techniques. Talk to us about Excel and VBA training for your business. We provide customised training that your end users will find useful straight away – not just going through a manual on formulas and functions they will never need or use. I grew up in businesses with large filing archives, microfiche machines, rooms full of filing cabinets, stacked shelving and the dusty ceiling space storage accessed with a torch in times of desperate need only! Today we create data in multiples so much greater than those days of typing pools, slow copy machines and dusty archives. However often digital data is stored in the same method that we used to store analogue data. This is really rather ridiculous when we think about it. 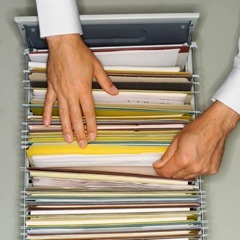 Before computers data could only be stored in one place in a filing system and the indexing method needed to be able to help you easily find that data. Today with the use of metadata we can store data anywhere and use powerful search algorithms to find and locate data. The key is the metadata. Without it we can be as lost as the person in the archives who discovers all the vertical tab filing labels have fallen off. The modern office stores data in most if not all the following places. Email, hard drives, network servers and storage, cloud storage places, USB external drives and mobile devices. How many times have you or someone you know spent ages looking for the file, email or image you “saved” and now can’t remember where it is? Email management is probably the largest time waster for businesses and office workers today. From Outlook 2010 on there is an awesome feature in Outlook that enables anybody to quickly and easily automate repetitive email management tasks. Effectively they are shortcuts that you can create that will mark items as read, move them to folders, forward emails to preselected team members and many other customisable actions. 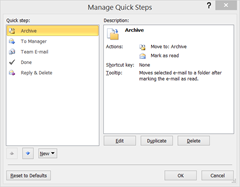 Click on an email and in the ribbon select the quick steps box. You can open the manager and look at the default ones, modify or duplicate them and play with the options. More help online to manage Quick Steps. If you are processing more than 100 emails a day ask us for help with managing them in significantly more efficient ways than what you probably are doing now. this applies to those people with hundreds of unread mails also! Did you know that email newsletter campaigns are more effective than any social media campaign as a way to grow your business? If you want help writing and sending newsletters like these that you can send to your mailing list then just talk to Tim today. Let me know if these are useful for you – and if you have a burning “how the heck do I do that?” question then ask that as well and we can write about it next newsletter. One of the easiest places to find potential time and therefore cost savings is in shifting your business accounting into the cloud. There are numerous advantages, but also some things to watch out for. Access to your accountant for live data review. Not having to close off your accounts, send them to your accountant and then wait for them to finish with them before carrying on working (or go and make the same end of year journals they just made) is a huge advantage. Your accountant can login (usually free) and make the changes while you can continue to operate. Up to the minute reporting. This sounds good but isn’t necessarily so. As a management accountant for many years I know the danger of providing inaccurate data to business owners. GIGO or Garbage in garbage out is a software development acronym that also applies to Accounting packages. If you don’t have all the data entered in correctly then the reports you might be relying on could be inaccurate. Licensing cost means updates are “free” and you are only paying an easy monthly fee. This has a catch for some systems – if you stop paying – your stop having access to your data. Some systems have offline data, others will allow you to download into excel. But this can catch people out so make sure you choose the right package. So how can you choose? We are partners with Financials for Office 365 so our advice could be biased but we can certainly give you some broad level advice as to which package might or might not be right for you. However for true unbiased advice feel free to get in touch with one of our customers Dianne Kennedy from Small Business Know How on 07 3343 3796. We can sit down with you and talk about your current accounting system and how to migrate this into the cloud in the most cost effective and efficient manner. Call to discuss today on 0414 770 002. Windows 10 will be released later this year. And if you upgrade from Windows 7, Windows 8.1 or Windows Phone 8.1 in the first year from its release you will get the upgrade free*. I'm not going to try and talk about everything Windows 10 related that has happened in the last 2 weeks. There’s been an avalanche of news both from Microsoft itself and also from the media speculation and hype growing around release dates, inclusions and exclusions and so on. We are telling customers to hold off on Win 8.1 upgrades now. There is no point in spending money on that when the Win 10 upgrade from Win 7 will apparently be free and “painless”. Of course we will be testing that thoroughly before we start assisting our customers to upgrade. However if you want to be a test dummy then feel free to let us know. There is a 12 month free upgrade deadline from release date so you do need to factor that in. The new apps store will include carrier billing – that means not having to enter credit card details on a mobile device – it will bill your mobile carrier instead. And there’s a rumour that iOS and Android apps will be ported into the store. A release date was “leaked” for July – still not confirmed officially but seems pretty likely. A second release of October will likely be for the first major refresh with features that didn’t make the cut in July being implemented in this one. 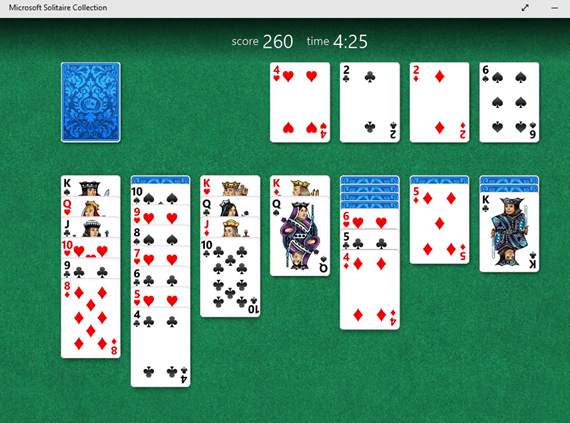 Solitaire is back – hooray! The best time waster of all. Where is the productivity tip here? If you are interested in previewing Windows 10 we can show you some devices with it running and then talk about when your business will migrate to Windows 10 and take advantage of the under the hood features that will make your staff more productive. *Doesn’t apply to customers running Windows Enterprise or on Software Assurance. Clutter is a new feature being progressively rolled out to Office365 customers. If you want to try it ask me and we can see if it is available for you and turn it on. It is turned on organisation wide but off by default and needs to be enabled per user account. Let us know if you get a lot of email per day. There are smart ways to work with your inbox that can help save you time and money. Training your staff in how to use email more efficiently and effectively is a small investment that can make them more productive. Call us today! If you want to know more about using some of the more powerful functions in Excel to improve your productivity then give us a call. Google Mobile Friendly Test – do you pass? In case you haven’t heard the biggest thing in recent times in search engine optimisation happened back on 21 April 2015 (22nd for Australia). Google implemented a major search engine ranking algorithm change for mobile search. With a huge rise in the use of mobile devices for search, and the high likelihood of local search using these devices it makes sense for Google to deliver localised results. However they are now saying for a mobile user the results should be optimised for the mobile device. So if your site is not optimised for mobile (passes the mobile friendly test) then it will automatically drop down the rankings in preference of sites that are friendly. Test your site today https://www.google.com/webmasters/tools/mobile-friendly/ Enter your domain name. If you fail the test talk to us about if you even need to pass. And if you do then we can work out the most cost effective way for you to achieve that. It doesn’t need to cost thousands of dollars. I haven’t sent a newsletter out for a long time – but there has been so much happening that this is the easiest way to update all our customers. As always I am available to respond to your requests, queries and provide you with information. I don’t charge by the phone call – and as I often say “it’s cheaper to ask me then it is for me to fix something after its done wrong”. Office 365 is really booming along with Microsoft constantly releasing updates, new features and other tools. Here are just some of the more recent ones you may or may not have noticed. Remember because the service is always online in the cloud it will update in the background without you even being aware of it most of the time. 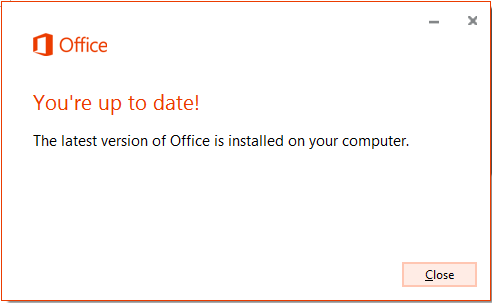 If you really want to check to see if you have the latest version then in any Office application on your PC click the File menu and choose Account. 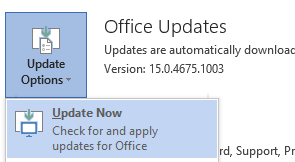 Click the Update Options button and click Update Now. You should get back this message. If not it will update for you. There have been lots of behind the scenes work to make the Office 365 system more robust and error free including better spam management and performance improvements. However there are some big items for users as well. If you have an Apple or Android device there has been a rash of recent updates to the apps for both these systems. Go to the Google Play Store or the iTunes App store today and download these apps to your device. And brand new today is the new Outlook App for iOS released today and a preview of the new Android app coming shortly. This can replace the normal iPhone or Android mail app and is far better at managing your email. If you need help configuring this on your device call me. No charge! The browser apps have been updated and are constantly being updated to include more and more functionality as well as better browser compatibility. Login to your Office 365 account with your email and password at https://login.microsoftonline.com and check out the new apps today. One of the major changes is in the layout of the online workplace. Click the blue icon on the left hand side to access these. Note: Delve is in development and not rolled out to all users yet. It is designed to work closely with Yammer and drive deeper collaboration in your organisation over document management and productivity. Talk to me today if you want to know how to access these tools and have them set up in your workplace. Cloud storage is one of the number one business conversations right now with businesses everywhere transitioning. At least 63% of Australian businesses use SaaS cloud apps and around 20% are using some form of cloud storage and this number is growing rapidly. Most major companies in Australia are already using some form of private or hybrid cloud. Email is the biggest app right now with more and more companies migrating their mail into the cloud. Financial apps and other business management apps are also growing rapidly. In Office 365 we have two forms of storage and with a Microsoft ID you have a 3rd space. Add Dropbox which is now supported by Office 365 and you have 4 separate spaces you can store data in. I’ll try and explain what each is and how to use them. 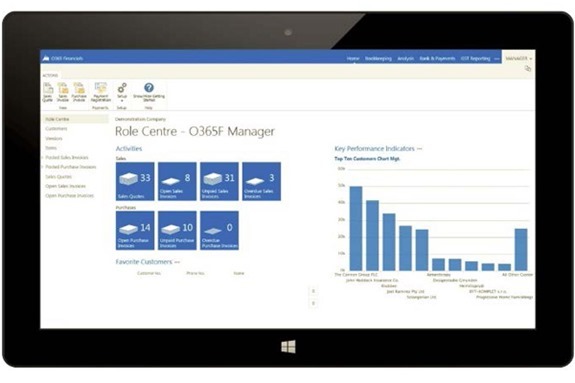 Most Office 365 customers have SharePoint. This is a document management system that is far better than using your local computer hard drives or even worse storing data on a USB drive! You can connect your SharePoint Document Libraries to your computer and they will sync across multiple devices. They are also accessible via your web login and mobile devices. This gives you real time access to your data on the go. Work on your client quote document in the office, access it again from your laptop or mobile device while in the taxi on the way to the airport. At the airport quickly login securely on a kiosk machine and review your email and check the quote one last time. At the meeting with your client access your spreadsheet with the data on it from their machine securely and make changes they require – leaving no trace once you log out. Finally after you have sealed the deal with the client login on your mobile and forward the revised quote to them. You can even give them read only access to the file right on your SharePoint site so as you change it they can see where you are up to. Once the project kicks off share your project timeline and task allocation to the client as well as milestone updates via SharePoint while keeping your internal workings private to your team. Can you see how much faster this can make your communications with your client? No more waiting until you return home, pass your notes to your secretary who types them up and sends it back and forward in an email chain until you get it right. SharePoint space is reasonably small – it starts at 10GB per customer and an additional 500MB per user account. It is designed for documents and spreadsheets and is ample space for most businesses. There are many features including very fine grained security access and sharing, version control and management. Talk to me about how you could improve staff productivity, reduce leaks of draft documents and get better mobile access to your work. Each user gets 1TB of space to store their personal data in. This could be company data or just their own pictures. Data can be synced between computers, accessed on mobile devices, shared with others as needed etc. One Drive is the retail free space that come with a Microsoft ID – which is what you log into your Windows 8 computer with. It is used to synch your personal settings from PC to PC as well as store your personal data in. it is a 15GB space. This should really be used for personal data, synching your phone camera pictures etc. Dropbox is an alternative cloud storage similar to one drive. It can be setup to automatically upload all your phone pics and videos (Apple, Android and Windows Phones). It comes with 2GB free for starters but there are ways to get more space for free or you can buy space. All these spaces will synchronise to a Windows PC or a Mac. Each have their use and I can help you work out which is bets for your data and usage requirements. Call me to discuss today on 0414 770 002. We are looking for a foundational customer – someone who is happy to be a bit of a guinea pig. We won’t charge for all the work we do – but come to an arrangement that works for us and the customer as we learn this new system inside out. If you are interested – particularly if you hold inventory then call or email me. As always we are on top of the cutting edge of Microsoft Office, learning how to speed up our workload, from creating email merges like this document to spreadsheet tricks and PowerPoint presentation tips. Anything that can be used to produce a better result faster we store away and share with our clients whenever possible. If you want us to provide a 1 hour training session on Outlook, PowerPoint Word or Excel or just using Windows 8, I will guarantee that when I leave you will have learnt things that will save you minutes or even hours per week. That translates into getting more things done or savings if you are paying staff. Special Deal – mention this newsletter and get a 1 hour training deal for up to 3 staff – in your office for only $165 including GST. One on one remote session for $88. Excellent presentation from both Tim and Ian, great insight to planning ahead to make the correct decisions to survive and grow in any business.